The Kettler Kadett Rowing Machine is a hydraulic, outrigger-type rower that gives its users a realistic sensation of rowing on water. 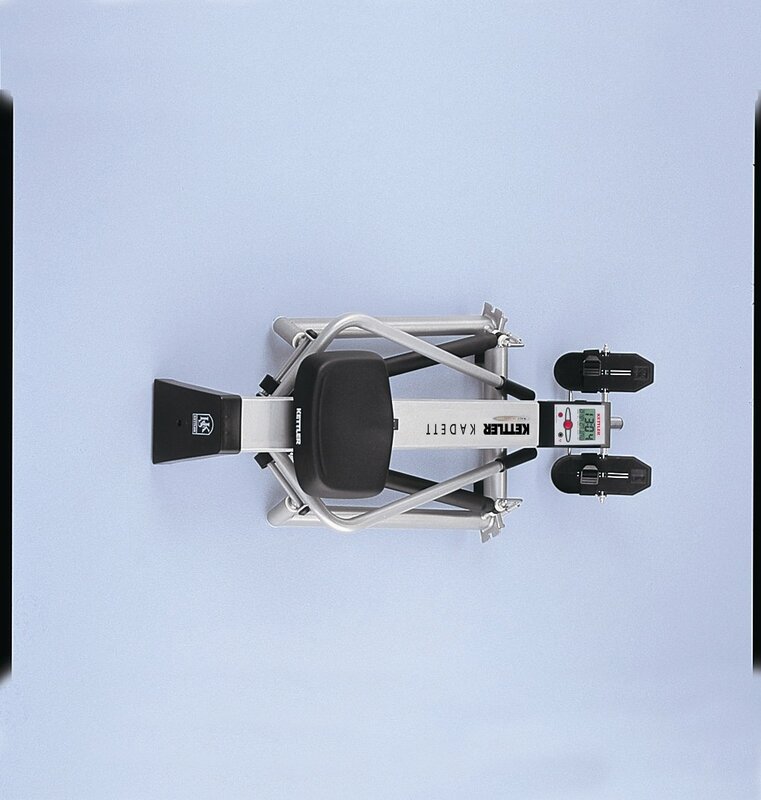 This rowing machine uses pistons for resistance and features resistance settings between 1-12. The Kadett’s training computer displays many measurements, including but not limited to time elapsed, oar strokes, rowing speed, and distance. This unit weighs in at 66 pounds; it measures 59” x 67” x 18” when in use and 59″ x 20″ x 18″ when in storage. Given the outrigger design of this rowing machine, a rower should have roughly 6 square feet of space to operate this machine.This rower made it to one of our top picks of the best rowing machine for this year. This rowing machine uses pistons and an outrigger style to simulate realistic rowing on water, which is a plus for people who want their rowing machine to feel like a real rowboat. The high carbon steel frame is solid and built well, so much so that Kettler has put a lifetime guarantee on it. It can hold up to 250 pounds comfortably, and most of its parts are durable and long-lasting. The frame may be solid, but it is still relatively easy to store as this rower folds up to a compact size for easy storage. Users can adjust the rowing settings to fit their heights easily, and the seat track is long enough to accommodate tall rowers. There are 12 levels of resistance, so rowers can exercise at whatever resistance level is right for them. The LCD display is a nice size and is easy to read; users can even set achievement targets in various categories and the display will beep once the users have achieved their goals. The console also includes a pulse monitor, so users can add cardio training as part of their workouts. When in use, this rower is relatively quiet, so users will not have to put up with loud or irritating noises while exercising. The thick padding on the seat ensures that users will not get uncomfortable from sitting during long workouts. The seat is also sturdy and does not wobble like some rowing seats will. The pistons are covered by a 3-year warranty and are fairly easy to replace if they break or wear out. The realistic rowing motion may be unappealing for people who prefer the motion made by standard rowing machines. The foot rests are uncomfortable and can break or malfunction fairly easily; they also may move and shift during exercise. Changing the resistance levels on this rower may be awkward; a possible solution is to make sure that the triangle tip is pointed towards the right resistance number. The measurements are displayed using the metric system, which may confuse American users not familiar with that measurement style. In some cases, rowers may feel as if they are pulling at a harder resistance level on one side than on the other. Some find this rower hard to assemble and to move around due to its lack of wheels. Some believe that the cost of this rower is too high for what it does. The Kettler Kadett rowing machine’s realistic sculling motion, sturdy construction, and adjustability make it a desirable rower. While some users have complained of poorly constructed foot rests, the high quality and durability of the rest of the rower can make up for loose footrests. The complaint of feeling different resistance levels can be attributed to human error and/or different levels of strength on the respective sides of the human body. Pricing complaints are subjective; each rower will have to examine the options and decide what rowing machine is the best value. Those who do not like the rowing motion and the flaws of this rower may be interested in something like the Concept2 Model D indoor rowing machine, which costs more but delivers a smoother motion and has more features than the Kettler Kadett.